In the 60s and 70s, Jackson had cemented his role as a leader in advocating for African Americans' access to opportunities and resources through nonviolent resistance. In the 1980s, he was preparing for a new chapter of political activism. Ssentamu, better known by his stage name, Bobi Wine, would grow up to become a musician and entertainer. He released his first songs in 1999; in 2017, he joined Uganda's parliament. The protests and marches of the civil rights movement provided the backdrop for Jackson's activism. For Wine, activism emerged from his music, which carried strong political messages long before he sought public office. "Music is a huge tool of communication," Wine told VOA in a studio interview. "I think what makes me a little different — what gives me an upper hand — is mainly the music," he added. Last week, the two men, born a generation apart but joined by a belief in progress through nonviolent protest, met for the first time. For Wine, the encounter was momentous. "It was historic for me," Wine said. "He's an inspiration." Wine contrasts his generation's desire for nonviolent change to the tactics of Ugandan President Yoweri Museveni's generation. Museveni has been president of Uganda since 1986, when Wine was just four years old. Through intimidation and violent crackdowns, Museveni has held fast to power. Last month, Peace Mutuuzo, a junior minister, told the Reuters news agency that the government planned to pass legislation clamping down on artists. Critics say Wine's popularity prompted the regulations. 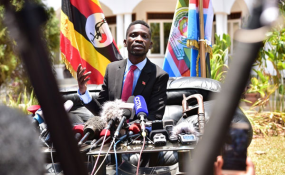 "We are living in a military dictatorship back in Uganda," Wine said. "Political parties are, ideally, vehicles for change. Not only change, but vehicles for governance — for good governance," he added. In Uganda, though, only parties that pose no true threat to Museveni's rule have space to operate, Wine said. "All the liberation efforts in Uganda have been carried out from the diaspora since, whenever Ugandans needed liberation, it has evidently been clear that there's no room to operate from back home." But it's the Ugandan diaspora that Wine is perhaps most keen to connect with. "The diaspora has a great, great, great role to play in the politics of Uganda," Wine said. Wine is less interested in speeches, however, than dialogue. It's constructive debate, Wine said, that will lead to ideas that can solve the problems Ugandans face. Observers expect Museveni will run in Uganda's 2021 polls. Saturday, Wine told CNN he's "seriously considering" running for president himself. But as he sets his sights on the next polls, he has no intention of picking up arms. "We draw inspiration from peaceful revolutions," Wine said. "Peaceful movements, like the civil rights movement in America.